Lancashire’s three Anglican Bishops have issued their annual Christmas messages for the County. They are available to view and share on social media now via YouTube and to play during church services across the Christmas period. The videos are also embedded below. The Christmas messages will be followed a week today with New Year greetings from each Bishop, which will also be available in written form on the Diocesan website with videos embedded on the website and also available again on YouTube. 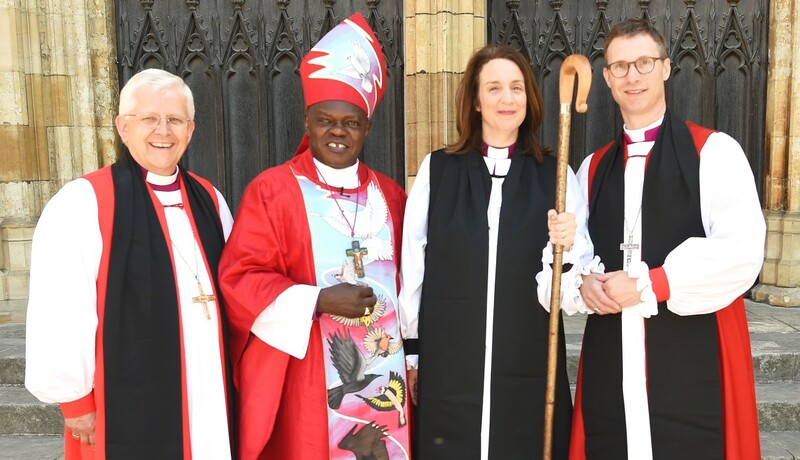 The picture above shows (left to right) Bishop Julian, The Archbishop of York, Bishop Jill and Bishop Philip at Bishop Jill's consecration in June 2018. You can also read a Christmas message here from the Archbishop of York, as featured in the Christmas edition of the Radio Times. The Christmas messages are also being distributed round the diocese via our MailChimp ebulletin 'Communications Update' and Word and PDF versions of that document are also available here. I was shocked by the results of a recent survey on poverty in the United Kingdom published in December by the very respected Joseph Rowntree Foundation. Child poverty has been rising since 2011/12; 4.1 million children live in poverty, a rise of 500,000 in the last five years and four million workers are living in poverty. These are scary statistics which, even if not fully accurate, offer a worrying commentary on the kind of society we have become and the struggle many face in making ends meet. READ the full text of Bishop Julian's message. Have you ever been to a ‘Messy Church’? It’s a different kind of church where young children and their parents can play, have fun and worship together. I recently attended a fantastic Christmas Messy Church at St James’ Lower Darwen and the place was packed with children who were ridiculously over-excited because Christmas is coming. And what’s great is that the excitement does not end with the children. It’s like an infectious disease. It seems that the adults are catching the excitement bug and going crazy themselves! Firstly, I want to say a massive thank you to everyone reading this message for such a warm welcome back to Lancashire. Six months on I’m still enjoying the role and it is such a privilege to be the Bishop of Lancaster. I’m finding ‘buried treasure’ in our parishes across the Diocese. Recently we held a Diocesan Conference for clergy and for lay people from across Lancashire. It was great to get a chance to meet so many people in one place. My heart has been warmed with hope for Lancashire. Now, I wonder if you’ve been following Strictly Come Dancing this autumn? I confess it’s my favourite thing to watch on a Saturday evening.